When yeast sits in the bottom of a fermentor for a period of time, the alcohol will kill some of the yeast. But how much yeast is killed? Yeast has a some what varying tolerance to alcohol, but it is not as black and white as I thought. For example, WLP862, Cry Havoc, is tolerant to 5-10% alcohol by volume, but it took about two weeks to reduce the yeast to 50% viability. The alcohol tolerance listed by yeast manufactures is slightly different that what is presented here. Yeast manufactures want to ensure that the yeast will complete fermentation of a wort that reaches a specified alcohol level. This graph shows the percentage reduction in viable cells over time when exposed to alcohol. This is analogous to how you might expect yeast to survive in a fermentation vessel after primary fermentation has completed. Being able to estimate the viability of the slurry based on time and alcohol content should give you a reasonable estimate of the viability of a harvested slurry. In addition the amount of cell death might give you an idea of the amount of autolysis related flavors that may be added to your beer. Five different mixtures containing the same amount of yeast, and varying levels of alcohol were allowed to sit at ambient air temperature (approximately 60°F) The cells were stained with methylene blue and the number of live cells were counted. 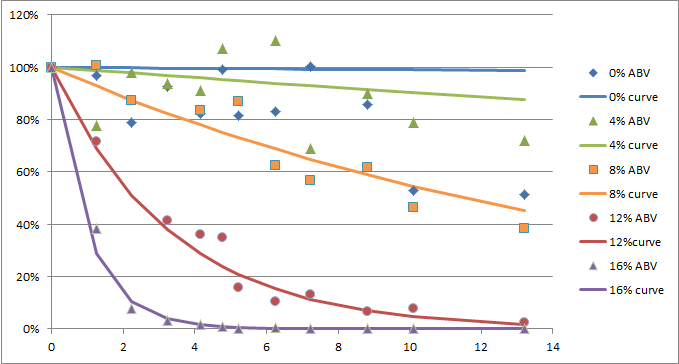 The graph shows the number of live cells compared to the initial number of live cells counted. 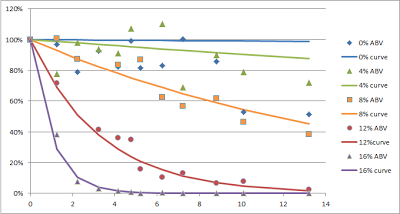 Because there was no growth, the numbers above 100% will give you an idea of the error associated with the cell counts. No method of viability testing is perfect, but these results should get you in the ball park. The top two sets of data, for 0% ABV and 4% ABV show very little drop in viability over time, but notice at about day ten there seems to be significant drop. This corresponds to the time I also started noticing mold cells growing with the yeast. Unfortunately, daily measurements created dozens of opportunity for contamination. Cell death was roughly exponential. At 16% ABV the death rate was approximately 70% death per day, where at 8% ABV the death rate was only 6% per day. This performance give a window into what you might expect for viability cells removed from a slurry. From the data collected here the death rate based on time and percent alcohol can be extrapolated. Down the left, each row is the number of days at that ABV level stored at ambient. Does this suggest that, for beers >7% abv that are aged for periods greater than 30 days, a transfer to a secondary vessel would be of benefit to remove as much of the yeast as possible? This also explains why, after several months of aging, I was unable to get my 7.5% cider to carbonate. The yeast were all dead, and those meek little ones who lived to ferment it only slightly quickly died off. Yes, A secondary fermentation is beneficial in some cases, and a >7% ABV beer aged for 30 days is one of those cases in my opinion. Very strange curve fit for 0 ABV and 4 ABV. My eyes see different fit curves. I guess the yeast viability decline is also true for yeast sitting in bottles. I recently tried to isolate yeast from an Imperial Stout (12 ABV) and I could not isolate any viable yeasts. And I had some other cases in the past where I could not isolate yeasts from higher ABV beers. Yes, it does drop off around day ten. I made a note about that in the text. It seemed to be associated with contamination. Further experimentation would be needed to confirm this either way. How did you get your fit functions for the 0 ABV and 4 ABV case in the first place? Did you exclude some data points for that (like data points after day 10 for example)? First an exponential fit was done to the data. then the exponential factor were fit to the ABV then the factors we applied to match the equation. Just bellow the table is a description of the equations that may make this more clear. Ok now I got it. I presumed those curves shown in the graph are fit functions based on the shown data points because, well there is no explanation in the text what exactly the "curves" in the graph mean. And I did not make the connection to the extrapolated function. Sorry for the circumstances and thank you for your additional explanations. This is a really interesting experiment, and you got some great data from it. I'm wondering what type of yeast you used. (Was it the cry havoc you mention in the text?) I imagine the next test would be to see how different strains tolerate alcohol. Also, it'd be interesting to see if flocculation plays a role in increasing survivability. That is, place different strains, one highly flocculent and the other powdery, in the same ABV and measure viability with time. I always assumed that flocculation helps increase viability because less surface area is exposed to the alcohol. Yes, that is my understanding of flocculation as well. It is a defense mechanism that the yeast employ. if I understood well the data were collected for yeast at ambient temp. Do you know the ABV effect when the yeast is stored in the fridge at low temp? Yes, you are correct, this was for ambient temperatures. I do not know how similar it would be in the fridge.